The NatureBond Silicone Manual Breast Pump is a silicone manual breast pump designed to collect "let-down", breast milk leaks and relieve engorgement. This pump uses a natural suction pressure. It is recommended by lactation nurses from Texas Health Presbyterian Hospital. This pump is advertised as being soft, comfortable, and safe. It is BPA Free and made from FDA Approved Food Grade Silicone. It has been lab tested by Bureau Veritas which is a World Leader in Testing, Inspection, and Certification. Included in your purchase of this pump is an air-tight vacuum package, dust cover lid, luxury pouch, silicone breast pump, and full color instructions. Also included is a hardcover box packaging which makes it nice for a shower or newborn mother gift. Weighing in at just 3 ounces, it is lightweight and also very portable. It collects up to 4 ounces/100 ml, and is small enough to fit in a diaper bag or handbag. Most Value for Money Breastmilk Saver - Silicone Breast Pump to collect "let-down" / breast milk leaks and relieve engorgement using pure natural suction pressure. Every ouch of breast milk is precious. Save it for your baby. Recommended by lactation nurses from Texas Health Presbyterian Hospital, USA. All-in-One - Complete set with Air-Tight Vacuum Packaging, 1 x Dust Cover Lid, 1 x Luxury Pouch, 1 x Silicone Breast Pump and Full Colour English Instructions, with Quality Hardcover Box packaging, which make it ideal as baby shower gift for newborn mothers. 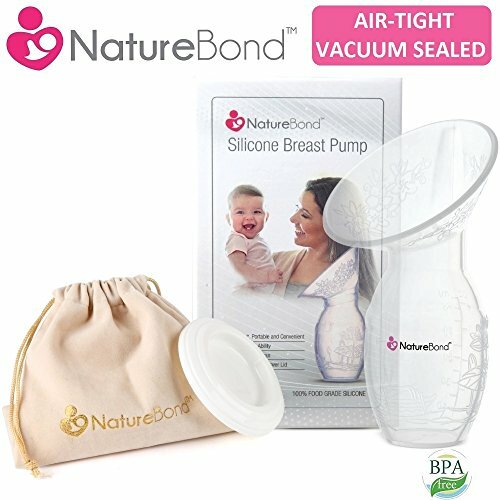 As of this writing, the NatureBond Silicone Manual Breast Pump had 498 customer reviews and 30 answered questions on Amazon. I've read the reviews and condensed the results. I hope that this makes it easier for you when picking out a breast pump. The nature of this manual breast pump makes cleaning so easy. There are no small parts to clean or any intricate curves. It is dishwasher safe and also can easily be hand washed. "The price is reasonable for a pump alternative so I ordered one and gave it a try. It's pretty straight forward to use but I still recommend watching some YouTube videos so you know what to expect and if you're using it properly." "So I was debating on Nature Bond vs the Haakaa and I was honestly nervous because of the price difference. I thought this one might not be as good, the suction must be weird, or something to make it cheaper. I WAS WRONG! It came yesterday and WOW. I used it on one side while nursing my baby on the other side and no joke- I got 3 oz my first time using it." The NatureBond Silicone Manual Breast Pump can store up to 4 ounces of breast milk. After the milk is collected you can then store the milk in bags or bottles. This pump is intended to collect the extra milk that can come out while your baby is nursing from the other breast. It can also be used alone to collect milk manually from one breast at a time. On another storage topic, the breast pump itself comes with a little storage bag. Mom's liked that the storage bag was discreet and made traveling with the pump that much easier. Because there are no hard parts to this manual breast pump, it is comfortable according to mothers who have used it. It is made of silicone and bends and moves to accommodate a wide range of breast shapes and sizes. I learned from reading the reviews that it's important to get the hang of it, and then it is very comfortable. This breast pump is efficient once you get the hang of using it. Because it is not an electric pump, you will need to use your hands to do the pumping. It is quiet, simple, and efficient. "I honestly bought this product without high hopes of success. I am so happy to report I was wrong! I'm not typically the type of person to write reviews, but this product deserves it. This is, by far, the best thing I have purchased! I was struggling with my traditional electric breast pump for weeks. I was feeling like a failure because I wasn't able to pump enough milk to store while ensuring that my newborn was getting fed enough himself." "I bought it expecting to be disappointed. My intention was to nurse my son on one breast and simply cup the opposite breast to catch the few drops of milk that are lost during stimulation. This product is amazing! I am catching all those "lost milk drops" plus more! I am able to express more milk while nursing than I was able to collect from both breasts combined with the electric pump! The product design is perfect-I am able to position it between my body and the baby so it is virtually hands free!" The NatureBond Silicone Manual Breast Pump really is about as simple as you get for a breast pump. There are no bells and whistles, but it is comfortable, efficient, and inexpensive. Most moms used this pump to collect milk that let down while breastfeeding. Many of the mothers who tried this were hesitant and not expecting much as far as results. But then they were pleasantly surprised to see that this nifty little pump did indeed collect milk that could be stored for their little one. I hope that my review helps you as you look to purchase the best breast pump for you. For more information, check out our Top 10 Breast Pumps Of 2018.